How do I know which polymeric sand is right for my application? With so many different hardscaping sands and dusts available in the market, how do you pick the best product to meet the demands of your specific application? In this blog post, we’ll break down the features and benefits to help you make an educated decision before purchasing products for your next project. Polymeric sand is used to fill in the joints or seams between concrete pavers or natural stone. The main function of this product is to improve interlock while creating a highly durable, cohesive joint material. Not only will polymeric sand improve the strength and durability of a surface, but it will also help resist damage from freeze/thaw, extreme heat, and erosion. In addition, polymeric sand helps to prevent weed sprouting and damage caused by insects. The key difference between polymeric sand and polymeric dust boils down to the size of the joints between the stones. In applications that have larger, natural stones with irregular contours, it can be difficult to create consistent ½” joints. For these jobs, polymeric dust would be the ideal product to use. With polymeric dust, you can have joints ranging anywhere from ½” to as wide as 6”, giving you the flexibility you need when working with irregularly shaped flagstones or other kinds of natural stone. 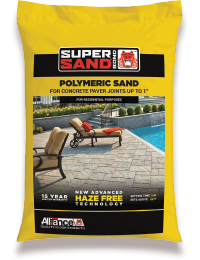 In terms of product benefits, polymeric dust stands up to freeze/thaw, extreme heat, and erosion, just like polymeric sand. It also helps prevent weed sprouting and damage caused by insects. 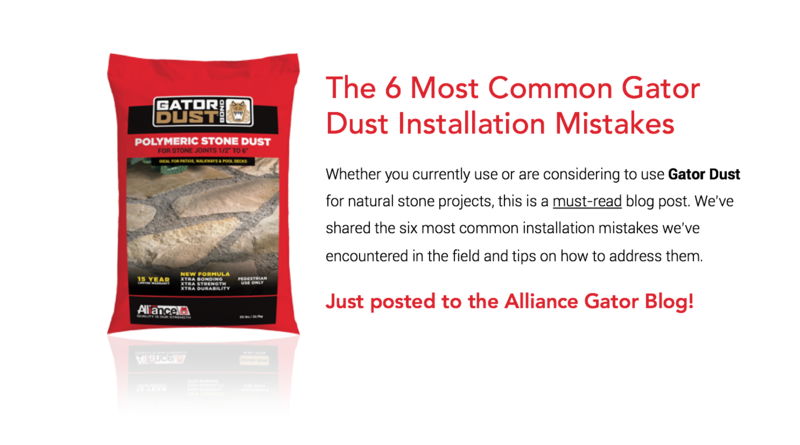 Alliance Gator sands and dust come in a variety of options so it’s important to understand the primary features and benefits of each. Let’s first start out by explaining the difference between our regular vs. G2 line-up of polymeric sands. Our original and time-tested Gator Supersand is a high performance polymeric sand designed for concrete, wet cast, and natural stone paver applications with joints of up to 1”. This product is recommended for residential projects such as pool decks, patios, and walkways. 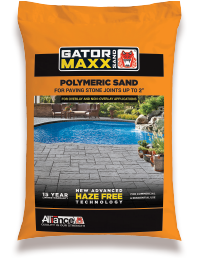 Our Gator Maxx sand is recommended for overlay and non-overlay applications that have up to a maximum of 2” joints. It can be used for both residential and commercial types of applications. Like Gator Supersand, the installation process of Gator Maxx is almost identical to using regular paver joint sand except for the application of water. Both Gator Maxx and Gator Supersand feature our New Advanced Haze Free Technology and are backed by a 15-year limited warranty. They are also both available in two popular colors: Beige and Slate Grey. In October of 2017, we launched a second generation of polymeric sands called G2. While many of the primary benefits remain the same, the key differences between G2 Gator Supersand/Maxx and the regular version of these products lie within the formula itself and a simplified installation process. 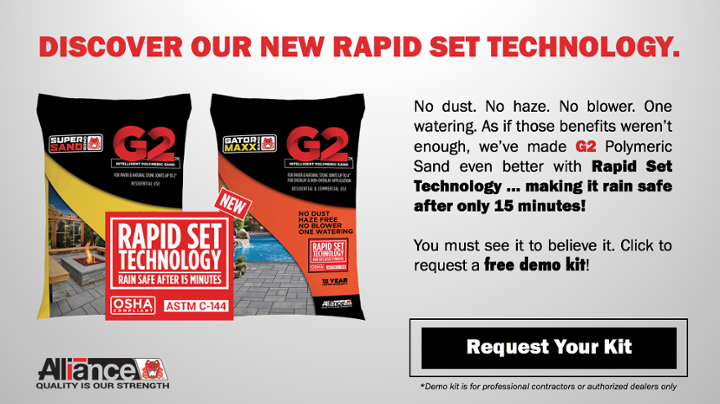 G2 Gator Supersand and Gator Maxx are manufactured by mixing specially calibrated sand with sophisticated intelligent polymers, which neutralize haze and dust. The result is a no-haze, no-dust product that only requires a single watering (in lieu of the multi-step watering process that a regular Gator Supersand or Gator Maxx project involves). G2 polymeric sand products also feature the added benefit of not having to use a blower during installation. G2 Gator Supersand can be used on joints of up to 2” and G2 Gator Maxx can be used on joints of up to 4”. And while G2 Supersand is available in our time tested Beige and Slate Grey, G2 Gator Maxx comes in four vibrant colors - Beige, Slate Grey, Ivory, and Black Diamond. Now that you understand the key differences between Gator Supersand and Maxx (and the G2 version of these products), let’s talk about Gator Dust. So what is it? Gator Dust is a unique mixture of polymer binders and calibrated stone specially formulated to strengthen the joints of any pedestrian natural stone application with joints of up to 6”. When installed properly, this product will become an incredibly firm, resilient joint material while still retaining flexibility and durability. However, this product should not be used for vehicular applications or in circumstances when stones have been installed on top of a concrete slab. It is important to note that natural stone slabs must be stable with no rocking before installing the Gator Dust. Gator Dust comes available in two colors: Beige and Slate Grey. The chart below outlines the features of each of our polymeric sand and dust products. Be sure to review the info carefully before deciding on a product for your next project. Happy hardscaping!